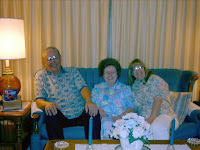 Some in my family may not be aware that they have an aunt and uncle still living in Mesa, AZ, Betty and Russell Roberts. Betty is the older sister of my father. They currently live in a retirement community near Falcon field. They have a son named Mark. 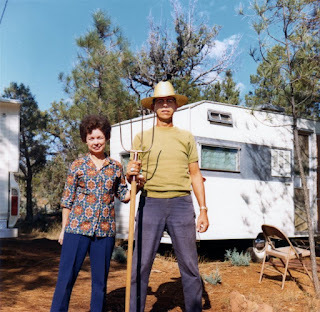 They also have a small cabin in Heber, AZ. The picture above was taken in 1972 in Heber. Betty is extremely nice and Mark has a great sense of humor. I don't know why my mother never liked them. Here is a picture of Betty and Bob taken in 1951. Ah... the good old days, when men wore hats and women wore gloves. Here is a picture from 1961 of Betty, Russ, and Mark. The most recent digital pic I have is from 2002, quality is not so good. This year with all the extra rain the desert has started blooming like mad. Everything is green. Mike and Chris wanted to go out in the desert and make "bang bang" while we were out there we took quite a few pictures of the flowers, in the area north of Florence and near Canyon lake. Enjoy.